Armed with sky-high expectations and seemingly boundless enthusiasm for how tech could reinvent industry in the digital age, the “blockchain” industry has been overwhelmed with blockchains. Not only are there multiple open public blockchain projects, but legacy institutions and corporates are building exclusive permissioned blockchains. So far this year, there have been specialty blockchains created for everything from credit default swaps to managing global supply chains. It’s unclear how these blockchains will need to interact with each other in the future to prove its benefits. But there’s consensus that some standards are needed to promote competition while eliminating redundancies. Entering into this wider discussion is the W3C, the international standards body for web development that has taken an interest in web payments. 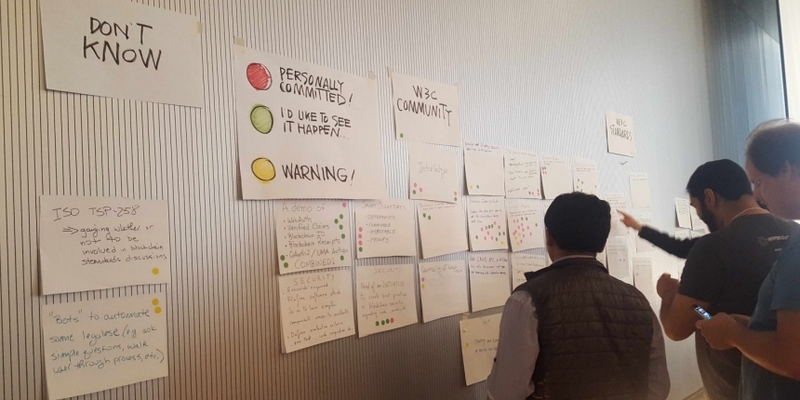 Last week, the W3C held its first blockchain workshop, an event that showcased how many areas of the industry are ripe for standardization as well as how much work needs to be done to bring together various stakeholders working on the technology. 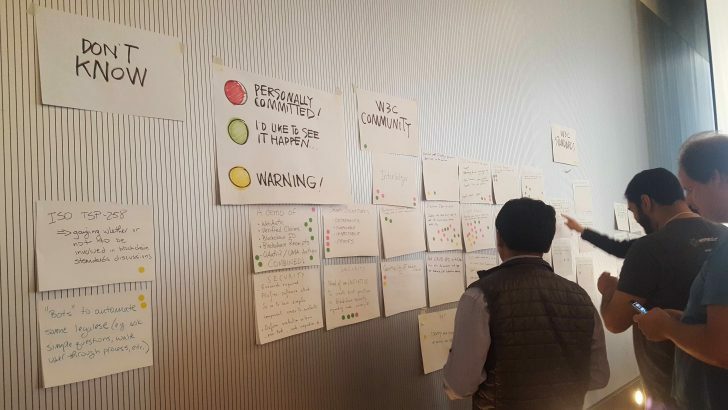 Among the participants, a few were apprehensive about standardization, thinking the industry was too young and standards could impede progress made through experimentation. The majority, however, see this discussion as one that’s driven by business need. Which is why there’s plenty of talk about interoperability. Most participants were interested in developing standard APIs and primitive data formats (those provided by the programming language) to allow both new and legacy applications to have consistent approaches to communicating with blockchains. First objectives in this area included key management and payment protocols, and most are layers above blockchain that use cryptographic approaches. Several representatives working on the Interledger Protocol and Lightning, a variation on bitcoin lightning networks, were in the room and had discussions on how those two similar systems could move forward so that transactions on both could be more compatible. Allen used SSL, a security technology he helped develop in the 1990s, as an example of the Web community coming to agreement over its approach and allowing all stakeholders to participate equally. This constructive collaboration is why Blockstream began participating in standards organizations. And while there were several well-known blockchain efforts in the room (Eris Industries, IBM Blockchain Labs, MIT’s Digital Currency Initiative, ethereum), notably, not many popular bitcoin industry stakeholders were at the workshop. These bitcoin players could have been helpful as the group discussed the possible standardization of wallet APIs. Some of these topics included the process for getting signed blocks written to a blockchain, how information is stored within blocks and what information can be stored off-chain. Hardware authentication was another area of significant interest. While dongles have been used for authenticating financial transactions within enterprise, dedicated hardware devices haven’t seen much success for consumer applications. Instead, many industry stakeholders think a user’s smartphone with SD cards and biometrics can be used to verify identity. It all comes back to identity, said Doug Schepers, a W3C technologist and team contact that organized the workshop. “The reason people are so interested in it is because usernames and password and the existing way identity is done is so flawed and hard to deal with,” he said. The idea is that transacting with a public/private key pair over a blockchain is more convenient and secure than today’s username/password identity schemes. Standardizing these identity iterations could move forward at a quicker pace because Microsoft is a powerful member of the browser-focused W3C already. Plus, the vendor has secured a number of partners for its blockchain identity program, and several representatives from Samsung’s mobile browser work spoke with Microsoft at the workshop about joining the identity initiative. These developments are especially important as the threat and instance of data breaches increases, occurring even at large institutions like Anthem and Swift. But while there’s meaningful excitement for blockchain identity efforts, some uneasiness mostly from the incumbents still persists. Several representatives of legacy financial services providers voiced concerns about counterfeiting and account takeover as it relates to blockchain systems which tout irrevocable and immutable identity. Others worried that blockchain systems only recreate the current system whereby a person’s identity information is stored under one master key. There was also discussion about how such standards could impact non-financial blockchain applications. At the workshop, this category revolved around content creators, and several presenters mentioned the ability to trade cryptocurrency tokens like contracts on a blockchain to have a transparent record of the history of digital media. The Internet of Things (IoT) could benefit from a transparent history of transactions and liability. Many think this era of connected devices communicating with each other will work through “if this, then that” smart contracts riding on blockchains. Examples include washing machines that detect issues and search warranty information to order parts or smart packages that monitor the temperature of shipments. Most IoT solutions today are based on centralized, hierarchical systems which are more vulnerable to attack than distributed, decentralized systems. Plus, today’s systems are typically device- instead of user-centric. In device-centric models, users would have separate apps for each device they had connected to the internet. Blockchains, many participants said, could coordinate a user-centric IoT environment. It seems the event has already inspired industry participants. One community group focusing on digital assets has already been formed since the event and plenty of others were conceived. The majority of these community groups will incubate ideas for standardization, allowing members to start forming specifications. W3C’s general blockchain community group will continue to expand its scope and keep the conversation going. Schepers also plans on organizing a follow-up workshop more focused on the browser vendors. As the first event of its kind, the blockchain workshop demonstration of how similar events will need to improve to get more people on board. For example, many conversations at the conference were more theoretical than concrete. Participants talked about how blockchains could revolutionize various industries, but the technical details of how these systems would do that were often glossed over. But working inside these standards bodies can not only allow blockchain tech to realize the reach of the web, but also cultivate environments for critical thought about how tech interacts with people. Keynote speaker and assistant professor of computer science at Princeton, Arvind Narayanan, gave the workshop a particularly important note of caution here. Bailey Reutzel is a veteran finance reporter, most recently covering the intersection of tech and finance for PaymentsSource. Her latest project Moneytripping is a Gonzo-style journalism project focused on exploring money, politics and finance in America.